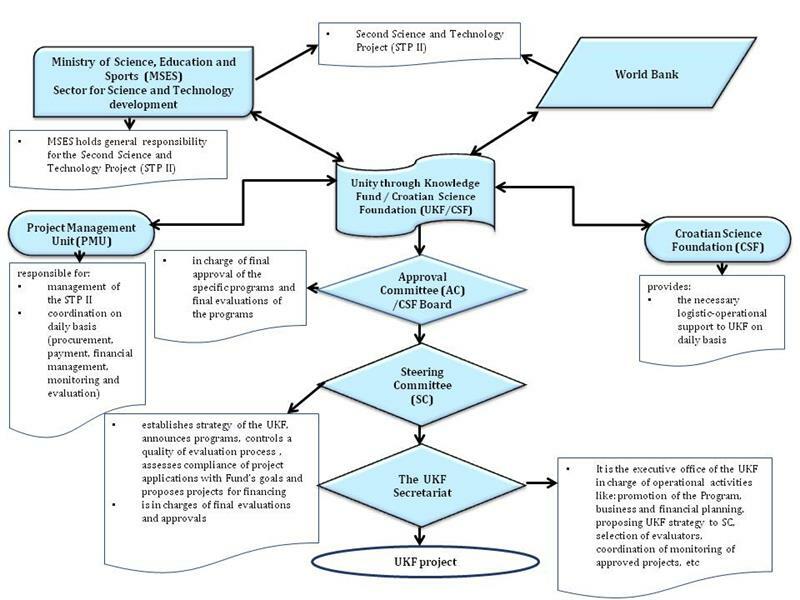 (i) In the framework of Science and Technology Project (STP) that is financed by the World Bank Loan No. 7320-HR, a program called “Unity through Knowledge Fund” (UKF) has been established. The motto of the program is: CONNECTIVITY, COOPERABILITY, CREATIVITY. This Fund will work on connecting the scientific and professional potential of Croatian Diaspora with the Croatia. (ii) After succesfully accomplished Science and Technology Project (STP I), Government of the Republic of Croatia and the World Bank signed the Advance Agreement for Preparation of Proposed Second Science and Technology Project Preparation Advance No. IBRD P4640-HR (STP II). (iii) Ministry of Science, Education and Sport (MSES) holds general responsibility for Preparation Advance of Proposed Second Science and Technology Project. The objective of the PPA is to facilitate the preparation of Proposed Second Science and Technology Project. UKF is a component of PPA and is managed by the Sector for Science and Technology development in MSES. (iv) Government of the Republic of Croatia and the World Bank signed the Loan Agreement for Second Science and Technology Project No. 8258-HR, on 22. May 2013. for financing, among others, the activities of the Unity through Knowledge Fund (UKF). (v) Ministry of Science, Education and Sports (MSES) holds general responsibility for implementation and coordination of the Second Science and Technology Project. (vi) Starting February 19th 2014, the UKF is established within and administered by CSF pursuant to the Act on the Croatian Science (Official Gazette No. 117/2001, 46/2009, 94/2010, 78/2012) Article 19 that also regulated the transfer of the UKF from MSES to CSF. (i) UKF is STPII component and for the purpose of the implementation of STPII and UKF management, MSES has nominated members of the Steering Committee (SC), who were appointed by the CSF Board (Approval Committee (AC)). (ii) Steering Committee (SC) is in charge of communications, objective-based initiations of individual UKF programs, final designs of individual proposals, and similar operational tasks. SC is also responsible for coordination and successful implementation of all UKF’s programs and activities, in accordance with directions, plans and agreed procedures. SC establishes strategy of the UKF, proposes specific programs to Approval Committee and announces programs, controls a quality of evaluation process and assesses compliance of project applications with Fund’s goals and is in charge of final evaluations and approvals of projects. The SC consists of prominent scientists from public and private sector. (iv) The UKF Secretariat is the executive office of the UKF in charge of operational activities like: promotion of the Program, business and financial planning, proposing UKF working strategy to SC, selection of evaluators, coordination of monitoring of approved projects, etc. The UKF Secretariat is run by the UKF Program Manager (Alessia Pozzi), as the principal executive. It also includes Program Analyst (Dijana Juroš) and Program Assistant (Anita Mikulić) , which administer the Program and report to the Program Manager. (v) The other stakeholders involved in operations of the UKF are CSF and MSES (PMU). CSF provides the necessary logistic-operational support (business premises, computers and network equipment, supply of office material, consultancy). The PMU is in charge of overall operational management of STPII in general, like procurement i.e. compliance of sub projects’ procurement procedures with "Extract 1. CSF – Procurement arrangements for sub-beneficiaries of UKF programs”, financial management etc..
Organization & Management - until 19 February 2014. (i) In order to manage the UKF, the MSES has nominated two committees with strictly separated duties: Steering Committee (SC) and Approval Committee (AC). (iii) The UKF Secretariat is the executive office of the UKF in charge of operational activities with the like: promotion of the Program, business and financial planning, proposing of UKF working strategy to SC, selection of evaluators, coordination of monitoring of approved projects, etc. The UKF Secretariat is run by the UKF Program Manager, as the principal executive. Since 1 November 2008 Program manager is Alessia Pozzi. It also includes a Program Analyst (Dijana Juroš) and a Program Assistant (Anita Pilić), who administer the Program and report to the Program Manager. (iv) The other subjects involved in operations of the UKF are BICRO and PMU. BICRO provides the necessary logistic-operational support (business premises, computer and network equipment, supply of office material, consultancy). The PMU deals with all aspects of PPA in general, as procurement, financial management, compliance of sub projects with Environmental Management Framework.